The U.S. ranks first among 178 countries for the highest per capita rate of firearm ownership. On average, each year firearms account for approximately 11 thousand homicides, another 22 thousand suicides and accidental deaths, and many more injuries. In the wake of these fatalities and high-visibility mass shootings, a very contentious debate has continued in our country regarding the role and future of firearms. 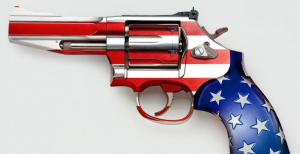 Should more people buy and carry guns? Should teachers bring guns into their schools? Should colleges and universities permit students and staff the right to carry concealed weapons onto campuses? Or should we go further by repealing the Second Amendment of the U.S. Constitution that grants “the right of the people to keep and bear arms”? 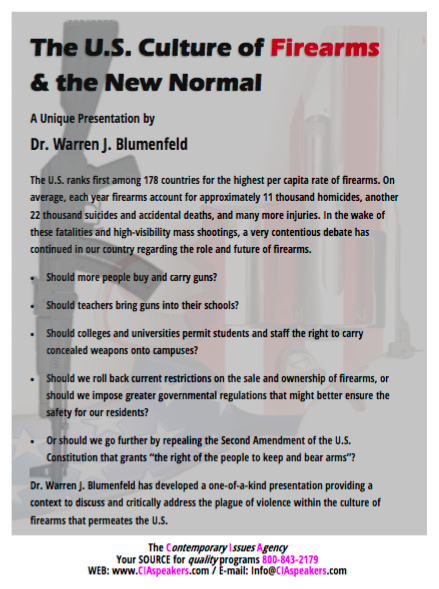 Dr. Warren J. Blumenfeld has developed a one-of-a-kind presentation providing a context to discuss and critically address the plague of violence within the culture of firearms that permeates the U.S.